Comparison of the 1859 model and the Tomahawk. Although the blade is flared, the curve is cut short by a small straight section at the top and bottom which gives the axe its distinctive shape. These axes tend to be dated and well marked with the maker’s name, and for government issue, a broad arrow and an N for navy. There are two versions of this axe, which are visually indistinguishable. The Mark 1 is made from iron, like the tomahawk, with a steel insert to form the blade edge. When the Mark 2 was introduced in February 1891 it was specified that the head be made ‘entirely of double shear steel’. Although no other change was specified a Pattern axe was made to govern future manufacture. 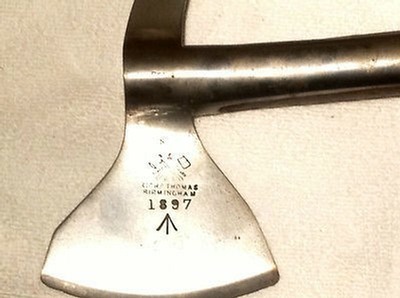 This is the only Government Pattern produced for the British boarding axe and its whereabouts is unknown. 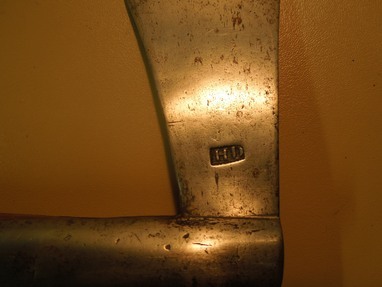 The latest date seen is 1899 on a naval axe and according to Ffoulks there were still 163 in naval issue in 1926. The Royal Engineers were issued this pattern in 1872 and declared them obsolete in 1897. An article on British Boarding Axes is soon to be published in the Arms and Armour Magazine, by this author, to reflect more recent research. The early British boarding axe had a chisel shaped blade, with a straight or very slightly curved cutting edge. On some axes the lower part of the axe drops away increasing the chisel angle but almost always the top of the blade stays in line with the top of the axe head. The langets are side mounted and integrally cast and often lobe shaped and curved slightly around the handle. Handles were around two feet long and often tapered down sharply at the axe head, swelling in diameter for a short section below the head where the top hand would grip, then gradually tapering to a smaller diameter where the lower hand would take hold and finally terminating in a ball. The axe was made from two 1/4” iron plates hammer forged together to form the 1/2” thick head and hammered out to shape the blade, spike and langets. 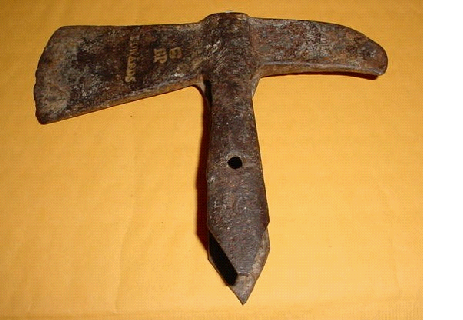 A steel bar was inserted to form the blade edge. The overall length with original haft is between 24 - 25” (61 - 64 cm). The blade edge to the point of the spike is generally between 8 - 9” (20 -23 cm) with some rare examples smaller at 7.5”. The cutting edge of the blade is 2.75 - 3” (7 - 7.6 cm). The spike is normally 3.5” (8.9 cm) or above and this holds true even on those axes with the smaller head. The length of the langets are between 5 - 5.5” (12.7 - 14 cm). Maker’s names can be of help when estimating the age of tomahawk axes. Of those that do show a name Sargant (or Sargent) is by far the most common. It is often found preceded by the initial ‘I’ and separated by a full stop positioned at the mid-point of the letters ie: I·Sargant. 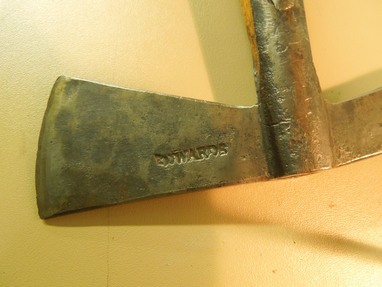 There are seven of these axes in the Royal Armouries collection of which four are marked I.Sargant and three marked with the I.Sargent variation. There are others with both spellings in private collections. All these axes are well marked to government ownership by the addition of the B.O and broad arrow on one or both sides of the blade and also stamped into the wood of the haft. The fonts are similar and the letters are 4.5mm high and the mark appears to be a word stamp as opposed to individual letters. Several Trade Directories of Birmingham between 1828 and 1835 show Isaac Sargeant, Sword Cutler of High Street Deritend, Isaac Sarjeant, Victualler, Edge Tool Maker and Hammer Maker of Deritend and in another directory, Isaac Sargant of 24 Deritend. It seems little can be inferred from the spelling of the name at this time. In the same directories there is another, more substantial, firm listed as Woolly, Sargant and Fairfax located at Edmund Street. This company operated from 1815 until 1879 and from around 1835 became Sargant & Son and then Sargant Brothers, none however with the initial ‘I’. It also had premises for a period in London. This company is significant in that it was listed as an official supplier, and sword cutler to the Board of Ordnance and the East India Company. They supplied swords, cutlasses, firearms and bayonets. Cutlers did not necessarily manufacture all the parts – blades, guards, hilts and scabbards - but commonly put them together to form the complete sword. It was therefore normal practice to outsource to other suppliers. 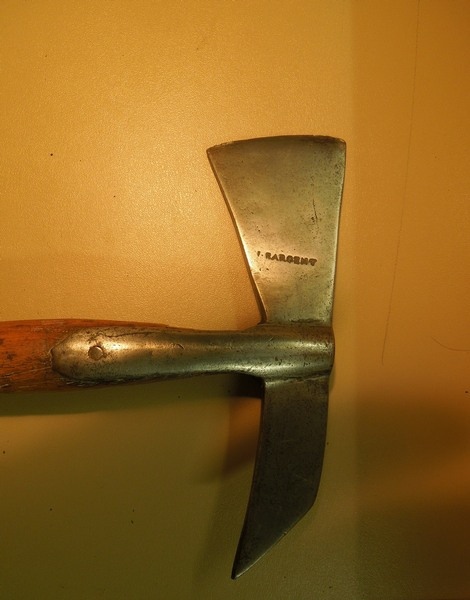 Any skilled metal worker with access to a forge, a hammer and an anvil can make an axe and it is likely that most boarding axes were made by blacksmiths or firms of edge tool makers. Perhaps Woolly, Sargant and Fairfax, who were recognised Board of Ordnance suppliers, sub-contracted axe manufacture out to Isaac Sargant, at Deritend, who may well have had a family connection. This would explain why his name appears on so many government axes so although not conclusive it remains a strong possibility that I Sargant is the Isaac listed in the trade directories. Note the name is spelt ‘ent’ but the initial ‘I’ and the centrally located full stop are the same. 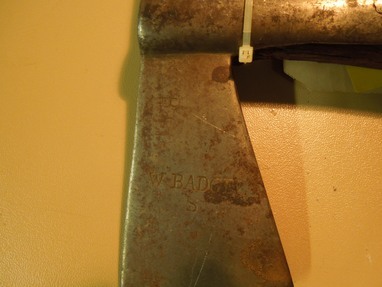 The oldest axe identified so far that has a maker’s name is one marked Reddell. This tomahawk is also marked with a barely distinguishable Crown over B.O and a broad arrow mark. There was a Reddell firm operating in Birmingham from 1803 until 1821 and in 1808 it was contracted to supply two thousand 1804 pattern cutlasses to the Board of Ordnance. It is likely that this axe was supplied by them and therefore dateable to that time period. One example has Edwards on one side and B.O and the broad arrow marked on the other (above). This earlier axe (right) is marked with a crown over B.P above the maker’s name. The B.P is somewhat confusing and may simply be a mis-stamp for B.O. No government markings but marked with a rack number on the handle. Marked with an S below the maker’s name and BO with the broad arrow on the reverse. The axe is also marked with a crown and what appears to be clover motif above. This may indicate an Irish manufacturer. 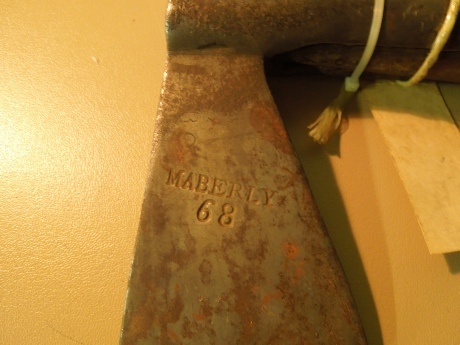 MABERLY 68 is marked on the reverse of five Sargant/Sargent axes in the Royal Armouries collection. 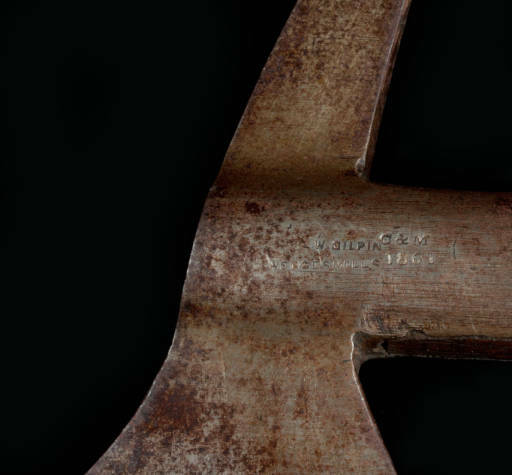 It is unlikely to be another maker’s name as the axes are already marked to Sargant or Sargent. John Maberly (1770–1839) was a major supplier of uniforms to the army and his son William Maberly (1798–1885) was an army officer and then Surveyor General of the Ordnance and then Clerk to the Ordnance (1832). But why their name would be stamped on a handful of boarding axes remains a mystery. 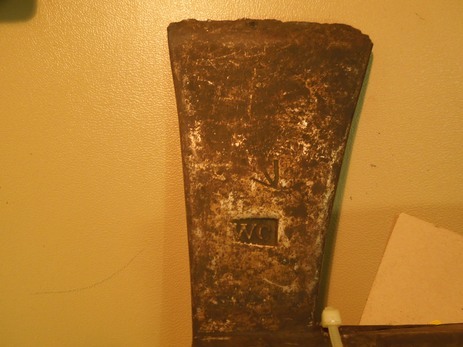 Three of these axes have consecutive rack markings so were presumably ship mates at one time although there is no ship listed to the Maberly name. Marked with the broad arrow. There are no marks at all on this axe. Note the slightly bevelled edges of the spike to make a sharper point. This is seen very rarely and may be an in service enhancement. The British Boarding Axe is notable for the fact that there was only one pattern for almost the entire age of fighting sail. This was the tomahawk which remained essentially the same until it was replaced in 1859 by the more robust flared blade model, although by that time the nature of boarding actions was rapidly changing. Gilkerson identifies the oldest known dateable axe to one excavated at Crown Point, New York - the fort on this site being a naval base in the mid 1700s which was burned down in 1773. The axe in question being excavated from the site of the fire. Throughout its long life this axe retained its flattish cross-section and side langets which made manufacture relatively easy especially in poorly equipped workshops around the world, some of which produced very crude examples. It not known when the word tomahawk came into British military terminology but contact and combat with Native Americans clearly had an effect on the weapons carried in that region. Ffoulkes notes that War Office records state that ‘the Ordnance issued 300 Tommihawks in 1761 to the 2nd Battalion of the Royal Americans’ and it also records that the 22nd Regiment adopted it as a standard sidearm in 1784. The navy adopted the term into everyday use and although referred to as a ‘pole axe’ officially, the name tomahawk was commonly used in ships’ manifests, journals and accounts and presumably in the sailors’ parlance of the day. 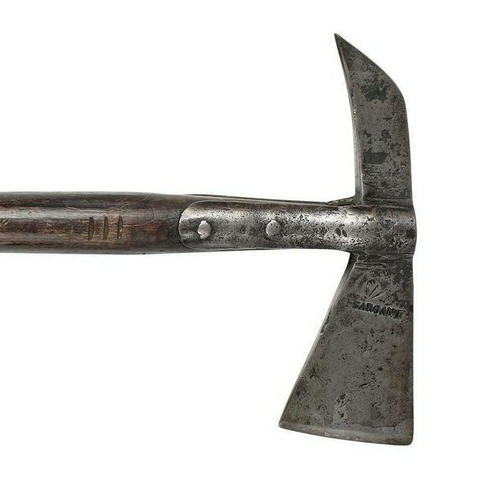 Considering that boarding axes were produced in their thousands and were carried in a ratio of at least one axe per gun very few survived the demise of the sailing ship and the British tomahawk pattern is rare today. Some of the remaining examples do not carry a makers name although they are often marked with the B.O and broad arrow mark of the Board of Ordnance. The lack of different patterns over the years means that it is difficult to date early axes and other than the Crown Point axe there is no solid evidence so far to date an axe to an earlier time. Although there was some variation over time – production carried on for approximately four decades - most examples fall within a narrow range of dimensions. The overall length with intact haft was 24” (61 cm). The blade edge to the point of the spike is generally between 7.5 to 8” (19 -20.3 cm). The cutting edge of the blade is 4.5" (11.4 cm). The spike is approximately 2.75" (7.0 cm). The length of the langets are around 6.75" (17.1 cm). The weight with an original haft is just over 2.5 lbs (1.13kg). W. Gilpin of Wedges Mill, Cannock which is just north of Birmingham. Richard Thomas an edge tool maker based in Birmingham. 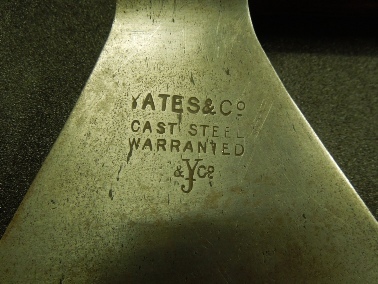 John Yates and Co. Also an edge toolmaker based in Birmingham from around 1838. 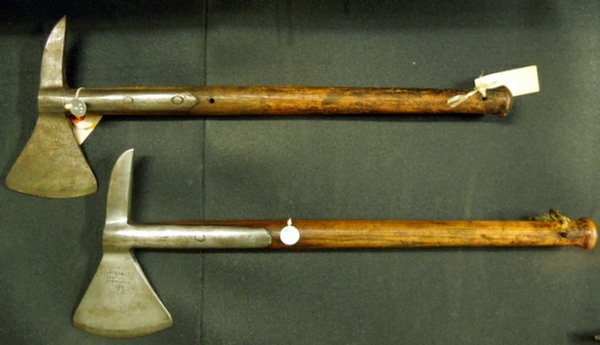 Axes attributed to the first two manufacturers generally show government marks of the Royal Navy. There is as yet no example of an axe made by Yates for government service so probably most were made for private purchase. 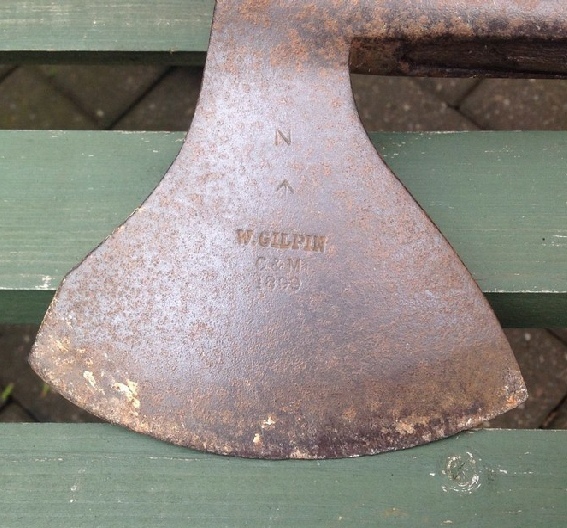 From the number of surviving axes there is little doubt that Gilpin was the main supplier to the navy with dates spanning almost forty years. The earliest known is dated 1861 and the latest is 1899. Gilpin/ Wedges Mills/ C&M/ and the date are centrally located on the upper part of the langet. WD together with the broad arrow indicating the War Department are stamped on the blade. The meaning of C&M is unclear but it is thought to mean Civilian and Military. Later axes are marked with the broad arrow and an N for Navy (instead of WD), with the maker’s name and date moved to the blade and occasionally a tiny inspector’s stamp of a crown over an initial is found on the upper part of the langet. 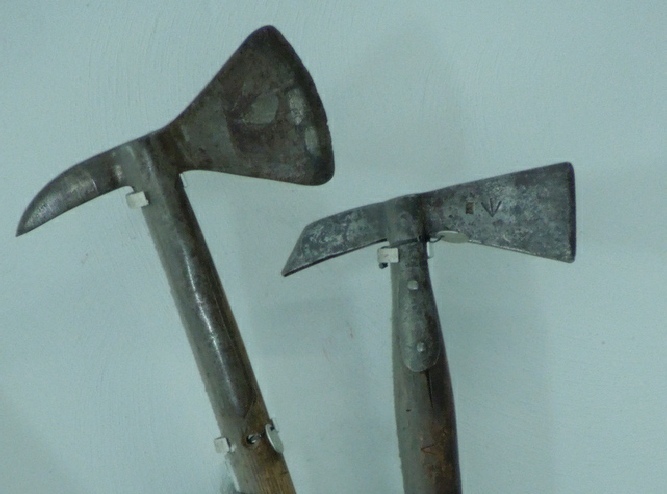 Axes made by Thomas are of similar dimensions but very few are known and these are all dated 1897 and are all steel. with the broad arrow and N also marked. There is also a trade mark logo of a crossed axe and hammer, which is sometimes located on the reverse of the blade. 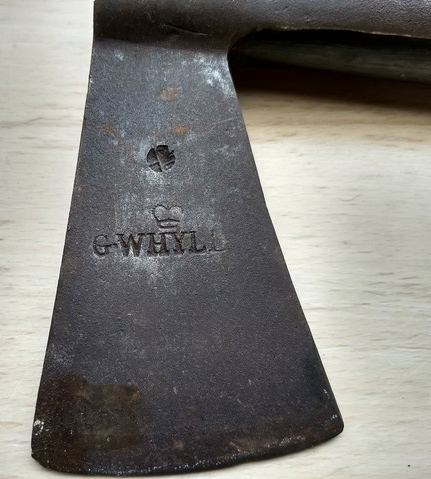 The third known manufacturer of this distinctive axe was John Yates and Co. These axes are slightly larger and heavier than those made by the other two producers and did not conform to the 1891 Pattern dimensions. No example has yet been seen with government markings. The axes are of all steel construction. The overall length with intact haft is 22.75” (58 cm). The blade edge to the point of the spike is 9.25” (23.5 cm). The spike is 3.6" (9.0 cm). The length of the langets are 8" (20.3 cm). The weight with an original haft is 2.75lbs (1.25kg).